Click on the gallery to look inside Book 2. Buy both Book 1 and 2 of Old Sea Dogs of Tasmania – and save $10 on the listed book price + shipping! Both books cover the entirety of Tasmania’s rugged coastline, including the remote coastlines of King Island, Flinders Island and Port Davey. Book 1 is captured entirely in stunning B+W imagery, whilst Book 2 is presented B+W and vivid colour, with five fold out sections. > Includes postage and handling. > Includes a complimentary Postcard Book. > Hardcover coffee table books. > Over 550 pages of images and stories. > All books will be signed. Click on the gallery to look inside the book. Old Sea Dogs of Tasmania Book 1 is a number #1 best selling title with over 4500 books sold Australia wide. This joyful and highly acclaimed collection of tall tales and striking black and white portrait and seascape photographs is set deep in the southern seas, where the Roaring Forties batter Australia's smallest state - Tasmania. Meet tough salt encrusted sailors, fishermen and shipwrights, who have made passage and experienced high adventures across all the worlds oceans on vessels large and small. In Book 1 you will round Cape Horn on a fully rigged Windjammer, compete in the Three Peaks Race, craft from Huon Pine the stunning 8 meter class yacht Varg, live the life of a river rat, step in the footprints of Joshua Slocum, race district dinghies, encounter whales and visit Hells Gates amongst other adventures. 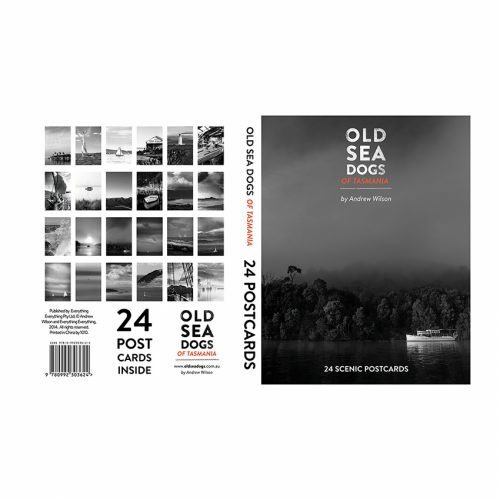 Both Old Sea Dogs of Tasmania books, by resident author and photographer Andrew Wilson, are not only homages in words and images to his island home, they are also love letters to the sea and those that cast away their lines and set forth seeking adventure and fortune across the globe. Coffee table books for anyone who wishes to be swept away, and a great gift for those hard to buy for fathers and sons! International shipping included in listed price. Old Sea Dogs of Tasmania Book 1 is a number #1 best selling title with over 4500 books sold Australia wide. This joyful and highly acclaimed collection of tall tales and striking black and white portrait and seascape photographs is set deep in the southern seas, where the Roaring Forties batter Australia's smallest state - Tasmania. Meet tough salt encrusted sailors, fishermen and shipwrights, who have made passage and experienced high adventures across all the worlds oceans on vessels large and small. In Book 1 you will round Cape Horn on a fully rigged Windjammer, compete in the Three Peaks Race, craft from Huon Pine the stunning 8 meter class yacht Varg, live the life of a river rat, step in the footprints of Joshua Slocum, race district dinghies, encounter whales and visit Hells Gates amongst other adventures. Both Old Sea Dogs of Tasmania books, by resident author and photographer Andrew Wilson, are not only homages in words and images to his island home, they are also love letters to the sea and those that cast away their lines and set forth seeking adventure and fortune across the globe. Coffee table books for anyone who wishes to be swept away, and a great gift for those hard to buy for fathers and sons! Click on the gallery to look inside the book. Old Sea Dogs of Tasmania Book 2 is a wonderful collection of tall tales and striking portrait and seascape photographs from deep in the southern ocean, where the Roaring Forties batter Australia's smallest state - Tasmania. Inside you will meet tough salt encrusted sailors, fishermen and shipwrights, who have made passage and experienced high adventures across all the worlds oceans. In Book 2 you will live the pirates life in the caribbean, race in the worlds greatest blue water classics, search for cray fish along the coastlines of Bass Strait's remote islands, endure gale force winds while capturing yachts competing in the world renowned Sydney to Hobart, make passage to a pristine harbour on a dutch tall ship, visit a world famous wooden boat festival and so much more. Old Sea Dogs of Tasmania, by resident author Andrew Wilson, is not only a homage in words and images to his island home, it is also a love letter to the sea and those that cast away their lines and set forth seeking adventure and fortune. A coffee table book for anyone who wishes to be swept away, and a great gift for those hard to buy for fathers and sons! Includes shipping cost of $60. Old Sea Dogs of Tasmania Book 2 is a wonderful collection of tall tales and striking portrait and seascape photographs from deep in the southern ocean, where the Roaring Forties batter Australia's smallest state - Tasmania. Inside you will meet tough salt encrusted sailors, fishermen and shipwrights, who have made passage and experienced high adventures across all the worlds oceans. In Book 2 you will live the pirates life in the caribbean, race in the worlds greatest blue water classics, search for cray fish along the coastlines of Bass Strait's remote islands, endure gale force winds while capturing yachts competing in the world renowned Sydney to Hobart, make passage to a pristine harbour on a dutch tall ship, visit a world famous wooden boat festival and so much more. Old Sea Dogs of Tasmania, by resident author Andrew Wilson, is not only a homage in words and images to his island home, it is also a love letter to the sea and those that cast away their lines and set forth seeking adventure and fortune. A coffee table book for anyone who wishes to be swept away, and a great gift for those hard to buy for fathers and sons! 24 pull out Tasmanian postcards of the island’s beautiful landscapes and seascapes in stunning black and white..